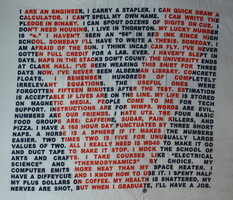 The back of the Virginia Engineering t-shirt that Engineering Student Council began selling about the time I started at UVa. 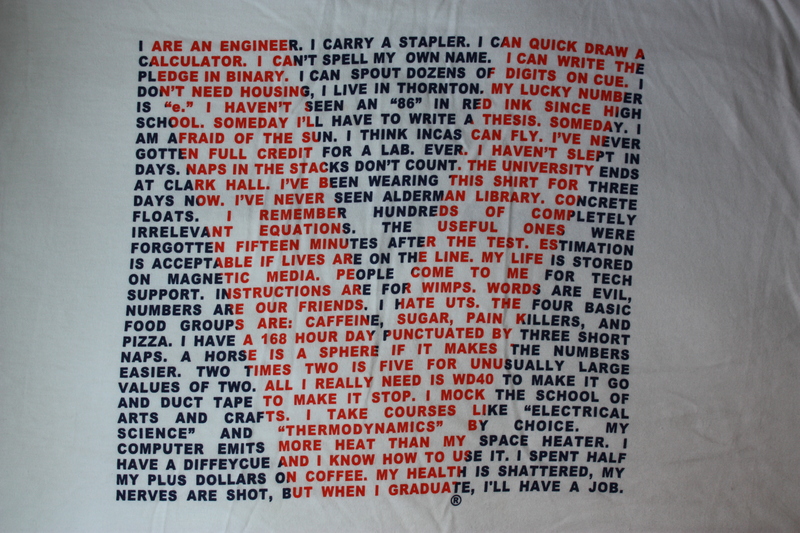 "I are an engineer. I carry a stapler. I can quick draw a calculator. I can't spell my own name. I can write the pledge in binary. I can spout dozens of digits on cue. I don't need housing, I live in Thornton. My lucky number is "e." I haven't seen an "86" in red ink since high school. Someday I'll have to write a thesis. Someday. I am afraid of the sun. I think incas can fly. I've never gotten full credit for a lab. Ever. I haven't slept in days. Naps in the stacks don't count. The University ends at Clark Hall. I've been wearing this shirt for three days now. I've never seen Alderman Library. Concrete floats. I remember hundreds of completely irrelevant equations. The useful ones were forgotten fifteen minutes after the test. Estimation is acceptable if lives are on the line. My life is stored on magnetic media. People come to me for tech support. Instructions are for wimps. Words are evil, numbers are our friends. I hate UTS. The four basic food groups are: caffeine, sugar, pain killers, and pizza. I have a 168 hour day punctuated by three short naps. A horse is a sphere if it makes the numbers easier. Two times two is five for unusually large values of two. All I really need is WD40 to make it go and duct tape to make it stop. I mock the School of Arts and Crafts. I take courses like "electrical science" and "thermodynamics" by choice. My computer emits more heat than my space heater. I have a diffeycue and I know how to use it. I spent half my plus dollars on coffee. My health is shattered, my nerves are shot, but when I graduate, I'll have a job." E-Council reports that Todd Harris, John Loizeaux, Nick Rosasco, and Christopher Thomas were largely responsible for the design. "I are an engineer. I carry a stapler. I can quick draw a calculator. My foreign language is Java. Less words equals more better. I plan on naming my first born after my lab partner. I hate UTS. My desktop runs faster than I do. If you can read this my backpack fell off. I never drink and derive. My dream come true is professors that come with subtitles. I still don't know where Ruffner, Cabell or Wilson are. If by "fun" you mean "problem set" then I'm having a blast! I can polar graph my name in cursive. Stacks refers to more than just my amount of work. I pop my collar because it's more aerodynamic. I mock the school of arts and crafts. Six hours of sleep is more than enough. I take your hardest classes as a break from REAL work. Someday I'll have to write a thesis. Someday. I promise you I am normal and I have the data distribution to prove it. The length of my facial hair indicates how my week is going. Imaginary numbers are real to me. I can hack Facebook. My palm pilot is the only PDA I'll ever get. I don't need housing, I live in Thornton. I'm happy I got a B, but I'm crying inside because I got a 52. My health is shattered, my nerves are shot, but when I graduate, I'll have a job."